The Imitation Game is a recently-released film starring Benedict Cumberbatch playing Alan Turing, depicting his code-breaking work during the second World War. 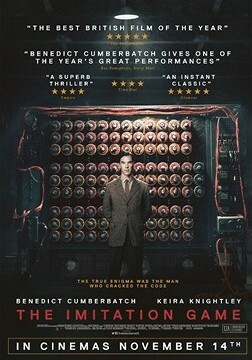 The titular imitation game is one form of the competition in natural language and artificial intelligence proposed by Turing which became more widely known as the Turing test; that came towards the end of a career arguably first notable for a hypothetical abstract computing device also later named after him. So the Turing machine and the Turing test bookend his cryptographic work, which is another field where his work is still celebrated today. (His wartime papers on the subject were so influential that their contents were restricted for 70 years as a matter of national security.) The school of mathematics at the University of Manchester run an annual cryptography competition named after him; this site has already written about the University of Southampton’s National Cipher Challenge and there is some degree of similarity, though the NCC permits sixth-formers to take part and the Turing competition restricts teams to those in Years 11 and below. Registration starts in December for the next competition, expected to run through the spring term of 2015. Cryptography isn’t just for schoolchildren, though, and nor are its competitions. While some puzzle hunts use its techniques, at least in part, and armchair treasure hunts use the field extensively, explicit competitions are less frequent. Not unknown, though; see Simon Singh on his Cipher Challenge at the end of his The Code Book. GCHQ have also occasionally run competitions like 2013’s Can You Find It?, now sadly offline. All this leads up to another cryptography competition, open to all ages, tied in with the new movie release and featuring film merchandise donated by StudioCanal as prizes, some of it signed. There are three codes to crack (from first glance, two likely relatively accessible and one more… thematic…) whose deciphered messages provide clues as to which square on a slightly abstract map to explore for fictional buried silver. The film has its general release in the UK this Friday, on 14th November, with the competition (whose entrants must be resident in the UK) open until midday on Friday 28th November. Happy hunting! Are you going to enter the competition Chris? I haven’t looked at the ciphers seriously yet, and have lots of shifts coming up at work over the next couple of weeks. (So if this site goes a little quieter than usual, that’s why.) We’ll see, but probably less likely than not.